I find the shadow of the guard rail an interesting pattern. That is the proper lingo on bile trails. "Passing on your right" or left. The first time I heard it on a bike trail I was shocked because I had no idea anybody was even behind me. And it is custom here to say, "Hi" or "Hello" or "Good Morning" after passing. I like your photo. The tale made it more interesting. Have you ever seen a Great Blue Heron? I feel sorry for you, I always ride my bike in park so the words of "on your left" or "on your right" are pretty much familiar for me. But so far I haven't got finger or someone screamed out loud yet. Oh the days you wished you carried a big stick with you. Hope your ticker is ok.
the bikers represent the fast paced generation that will wipe you out if you dont step out of their way! 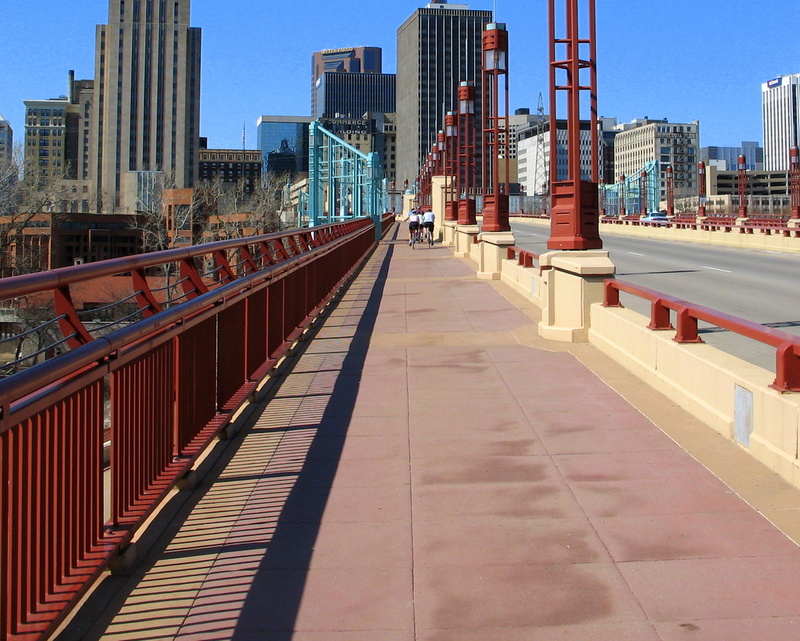 Hey, have you been wondering why they did not reinstall the flags on the Wabasha Bridge (OK, the Wabasha Freedom Bridge)? I expected them to go back up in the spring, but they still aren't up... maybe in the next day or two for the 4th. Humm, they still are not out? I took this photo in the early spring and also figured they were waiting for the warmer weather season. The flags give that bridge character and helps one get a better understanding of the bridges name. No bike bells on the bikes? Here, that's what I hear first and then often a greeting as they go past. I guess there is a set protocol of which side they're supposed to pass on (probably the left, unless there's a designated bike lane as there are in some places). Despite what happen this is a realliy nice photo. The color are clean and brilliant and the lines and composition well done.